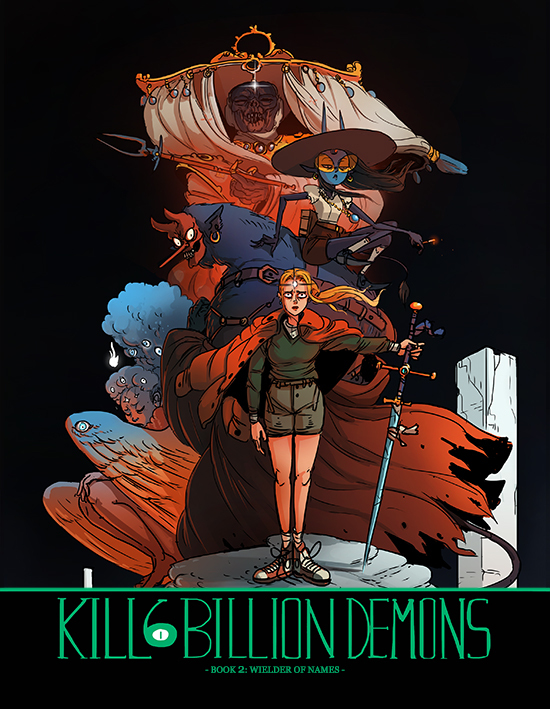 Though some readers may have known about it for a while, I’m very proud to announce officially that Book 2 of KILL SIX BILLION DEMONS, Wielder of Names, is releasing January 3rd with Image Comics. You can now pre-order it on Amazon and other major retailers, but I highly recommend ordering it from your local comic shop first. It’s printing much larger than the first volume (it will print 8.5×11 which is magazine size for comparison) and it contains the entirely of Wielder of Names, about 123 pages, making it about a third longer as well. As always everything in my comic is and always will be be readable for free online right here, but if you enjoyed it and want to pick up a print copy, it’s probably the best way to support me other than Patreon. The book starts with the devil drinking contest, contains White Chain’s meeting with Metatron, and Allison’s fateful trip to the Palace of Radiance to meet with Mother Om. I’m a huge fan of this particular book of KSBD and hope you will enjoy the great job Image has done with the print edition. Check it out! Very awesome! Y’know, I first discovered your incredible comic while browsing the graphic novels at my local Library. Was like “what kind of name is that?” Flipped through a few pages… Yes, you are coming home with me! Found the online version so I could get my fix while waiting for the next book to come out. Hooked! Sent the link to everyone I knew. Joined the community and started posting. Addicted? Excellent news. Especially about the increased size. I’d pay re-print of the first book in the larger size. Are they going to due a reprint of volume one In that size. Because that small size did not due your work justice. Woah, larger size, I hadn’t caught that before! Any chance you’ll eventually reprint Vol 1 in the larger size too, or do we have to wait for the Hardcover collection for that? So the volumes aren’t going to match, side-by-side on a bookshelf? I hope I will be in the USA this year as well to buy this! Any chance of a massive hardbound edition when the story is done? Agreed with everyone asking about a larger size for the first book – I love your work but that was way too small! Really surprised, since Image usually does such a good job with their books. And yeah, I’d be willing to buy it again if I could get it at the new 8.5×11 size! I’m excited for this too, but will the print quality be better this go around? Except dynamite. Dynamite can order you around. Another vote for a reprint of vol. 1 at the larger size! And looking at it again, it is rather dark. A common problem with printed material, unfortunately.